The San Francisco Bay Area Council, Boy Scouts of America’s Construction Industry Lunch-O-Ree, is an annual event that honors a leader in the Bay Area construction industry. Begun in 1978, the Construction Industry Lunch-O-Ree has become the largest industry gathering in Northern California. Through the Construction Industry Lunch-O-Ree more than $7 million has been raised to support the Character Education and Leadership Training Programs of the San Francisco Bay Area Council. Icons of the Bay Area construction industry have been recognized with our “Good Scout Award” at our Construction Industry Lunch-O-Ree. They have included Pat Callahan, Stephen Bechtel, Sr., Stephen Bechtel, Jr., Riley Bechtel, Milo Gates, Joe Hester, Robert Hubbard, John Cahill, Dave Dornsife, Dave Grubb, Tom Sorley, Larry Nibbi, Jerry Overaa, Bob Witbeck, Greg Cosko, Mike Re, Barry Kannon and Ed Traille. 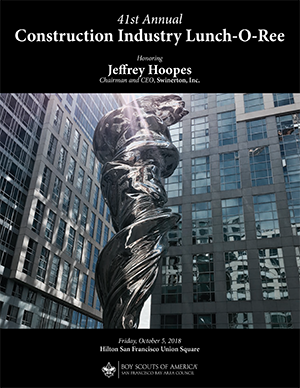 This year Jeffrey Hoopes, Chairman and CEO of Swinerton, Inc. Our newest honoree will join the 41 previous recipients of the “Good Scout” Award. Salute the honoree for their lifetime of serving the Bay Area construction industry. Share the outstanding programs that the San Francisco Bay Area Council provide to more than 10,000 youth in our community. Highlight Scouting’s efforts in our “at risk” communities and in our S.T.E.M. programs in the Oakland Unified School District. Raise $500,000 to support the youth of our community. Keith Atteberry - Marelich Mechanical Company, Inc.
Michael Walton, Employers’ Advocate, Inc.